Reel Rewards Program | Tailwaters Fly Fishing Co.
Our Reel Rewards program is set up to offer legitimate discounts to customers who shop with us regularly. Reel Rewards members are also given early access to exclusive offers, deals, promotions and invitations throughout the year. In today’s cutthroat world of specialty retail, we are hoping to remain as competitive as possible at the cash register. In addition to ensuring our loyal customers are getting a good deal, don’t forget that the customer experience shopping with Tailwaters cannot be matched. We are experts that have used the products we sell on the water and on the road traveling to the world’s local and destination fisheries. Our staff of professionals offer the highest level of customer service imaginable. Competitive pricing, expert advice, hands on service, a beautiful five thousand square foot showroom, a warm smile, and a cold beer are all part of the Tailwaters experience. These benefits cannot be matched while shopping online elsewhere or with our competition. We are Texas’ Fly Shop. Join Reel Rewards now and come see us! Already a Reel Rewards Member? 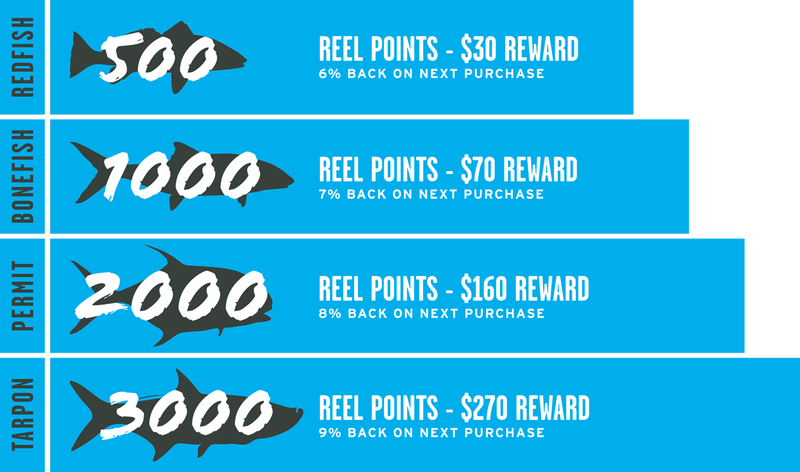 The Reel Rewards offers certain rewards, which may not be identified to you in advance. Only one person per rewards program. Number, type and frequency of rewards are based upon a number of factors, each subject to change, including without limitation, volume and type of purchases at Tailwaters Fly Fishing, type and amount of personal information provided (for example, a unique and valid email address and phone number), and type and amount of participation in and/or interaction with Tailwaters Fly Fishing activities. In the event of any discrepancy, Tailwaters Fly Fishing determination of the size of the reward shall be final. When earned, rewards will be identified by visiting getmybalance.com, on your e-receipt or inquiring at Tailwaters Fly Fishing. Rewards are subject to change or substitution without notice. Points are not earned for discounted items, purchases made with a gift card or on non-inventory items (special orders), lessons or education programs, repairs or trips booked with the travel department. Rewards may not be exchanged for cash or any cash equivalent. If you forgot to identify your membership while making a purchase in the shop, you can get credit by notifying a store manager at your next visit. A unique and valid email address is required. Tailwaters Fly Fishing has no responsibility to retroactively apply rewards or use of the membership. All rewards will expire if the rewards account is inactive for 2 years (no purchase has been made).